Sophia and Olivia Doerflinger-Duffy and Caden O'Neill from Portumna who star in the award winning short film, Body Of Christ. BODY OF Christ, an award winning short film - which runs for only 81 seconds - and which was made in Galway has been selected to screen at two major international festivals this spring. 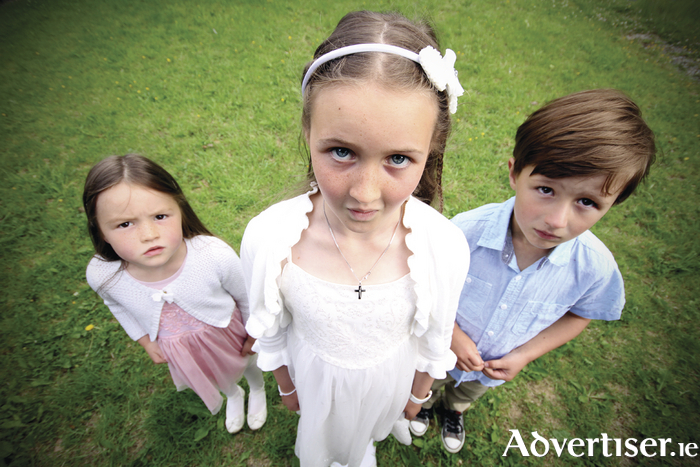 The micro short, directed by Amy-Joyce Hastings, who is originally from Oughterard, stars Sophia (aged eight ) and Olivia Doerflinger-Duffy (aged four ) and Caden O'Neill (aged five ). It was filmed in Portumna where the children live. The film has been selected for this month's London Short Film Festival, which The Guardian called "the best short film festival in the world", before going to the Chicago Irish Film Festival in March. It was screened at the 2016 Galway Film Fleadh's One Minute Film Festival strand where it came second in that strand's competition. It was then selected for festivals in Miami and Rome and was screened at Culture Night in the Galway City Museum. It had its Dublin premiere at the Underground Cinema Film Festival in September, where it won the award for Best One Minute Film. Amy Joyce-Hastings has starred in rom-com The Callback Queen, which received two IFTA nominations in 2016, and the Emmy Award winning television series The Tudors. Body Of Christ is her third short as writer/director. Her fourth short as a director, Agape, will be shot in Dublin next month. She is currently working on a feature length script entitled After The Rain. To view the film go to vimeo.com/171912019 and type in the password is Galway1.